Lee Woolery | Troy Daily News This year’s Troy Athletic Hall of Fame inductees (from left-right), Dan Cox, Vickie Felver, Todd Denlinger and Jason Manson, are introdcuted prior to Troy’s football game against Turpin Friday at Troy Memorial Stadium. Also inducted into the hall of fame over the weekend was Hildred Byrkett, who passed away in 2006. 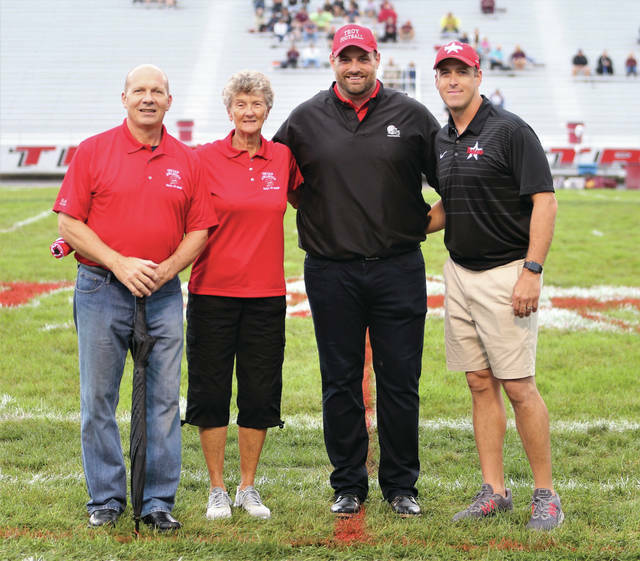 TROY — Five new members — Hildred Byrkett, Vickie Felver, Dan Cox, Jason Manson and Todd Denlinger — were inducted into the Troy Athletic Hall of Fame over the weekend. It is the sixth class to be inducted into the hall of fame, bring the total membership to 35. There were 10 members inducted into the inaugural class in 2013 and there have been five members inducted every year since then. The hall of fame selection committee is actively seeking nominations from the community. Nomination forms are available at the Troy High School Athletic Office. Once someone has been nominated, the selection committee keeps those nominations on file for future votes. Nominations for the next class are being accepted now through the first week of April. If one considers Troy athletics started in the late 1800s — on a limited scale, as many sports that are now varsity sports were not varsity sports more than a century ago — a disproportionate number of inductees have come from 1960 or later. Taking into account the year the hall of fame member graduated from Troy — and not counting the four coaches who have been inducted — there were five inductees who graduated prior to 1960 and 26 who graduated from Troy since 1960. There are several reasons for this: the growth of high school athletics — in particular, girls athletics — since 1960, the nomination process and finding information, awards and statistics for potential inductees who competed prior to the 1960s. The fact there are more varsity sports — there were no high school soccer, volleyball or hockey teams (just to name a few) at Troy in the early 1900s — certainly has had an impact. Also, girls varsity sports scarcely existed at Troy prior to the passage of Title IX in 1972. Girls today have far more opportunities to participate in varsity sports than their predecessors. Finally, many athletes who competed prior to the 1960s have, remorsefully, had their accomplishments lost to history. The Troy Athletic Hall of Fame accepts all of its nominations from the public, and many of the fans, family members and friends most likely to have nominated a star athlete from the first part of the 20th century have since passed on. Also, the documented record of accomplishments of those athletes is sketchy, at best, and impossible to find, at worst. 2000s — Fox, Terwilliger, Greulich Coduti and Denlinger (4). This demographic is a little harder to calculate, as many members of the hall of fame played more than one sport in high school. For our purposes, we first looked to see if there was a sport for which an athlete is more noted. For example, Dielman played both football and basketball at Troy — but considering he was a Pro Bowl offensive lineman for the San Diego Chargers, he is counted as a football player. Todd Darbyshire was a three-sport athlete at Troy, but was a state wrestling champion, so is therefore classified as a wrestler. In this year’s class, Manson and Denlinger both were multi-sport athletes, but played college football, and are counted as football players. One athlete, Fox, was inducted for his accomplishments in cross country and track. Considering the similarity between the two sports, he is counted once in a combined-sports category. Finally, there are six athletes who achieved nearly equal success in multiple sports and were inducted as “multi-sport” athletes. Scarff played both football and baseball at Indiana University, for example. Evans was a state champion in gymnastics and a state runner-up in the pole vault. In this year’s class, Felver played three sports in both high school and college and Cox played three sports in high school and two in college. Felver also is a unique case in that she could be counted either as an athlete or coach. For the purposes of this article, she is counted as an athlete. Not surprisingly, football dominates the landscape with 12 inductees. Considering football is the oldest sport at Troy — many did not become varsity sports until decades later — and its rich tradition, football having the most inductees was to be expected. Current varsity sports with no inductees — Soccer, golf, tennis, bowling, hockey and softball. It does bear mentioning, however, that one of the “multi-sport” athletes, Rhoades Saylor, played both soccer and softball, while another multi-sport athlete, Felver, played tennis. Denlinger, meanwhile, played one season of hockey at Troy. There are no known representations for golf or bowling. https://www.tdn-net.com/wp-content/uploads/sites/21/2018/09/web1_2-HOF.jpgLee Woolery | Troy Daily News This year’s Troy Athletic Hall of Fame inductees (from left-right), Dan Cox, Vickie Felver, Todd Denlinger and Jason Manson, are introdcuted prior to Troy’s football game against Turpin Friday at Troy Memorial Stadium. Also inducted into the hall of fame over the weekend was Hildred Byrkett, who passed away in 2006.